Summary: Steamcook perfect eggs in minutes. Cook up to 7 eggs at once. Get a free baconwave with purchase. 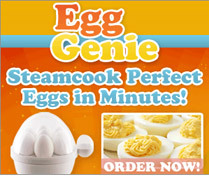 With the EggGenie, you can now steamcook perfect eggs in just minutes! You can cook up to 7 eggs at one time to help you save time while cooking. It's perfect for any type of eggs such as soft, medium or hardboiled. You can even use it for other food items such as vegetables too. It includes a sound and light indicator to let you know the eggs are perfectly done.